You can create a personalized debit card featuring a photo you choose - a loved one, your best friend, favorite pet or your favorite vacation spot or by selecting an image from the gallery of photos. 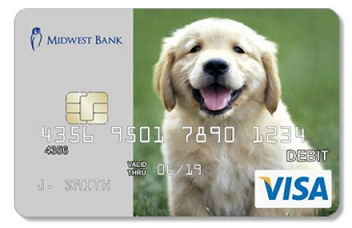 Whatever means the most to you will be proudly displayed on your Midwest Bank debit card. Upload an image of your choice from your computer, following the Image Guidelines, or choose from a wide range of gallery images including your favorite local school logo! Select from 3 different card options, Edge to Edge Photo, 2” Photo or 1” Identification Photo. 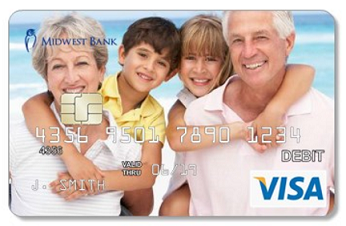 Once uploaded, the image is displayed behind a template showing how your card will appear. The image can be scaled, flipped or rotated until you are satisfied with the design. The image is stored to make card reissues a breeze! 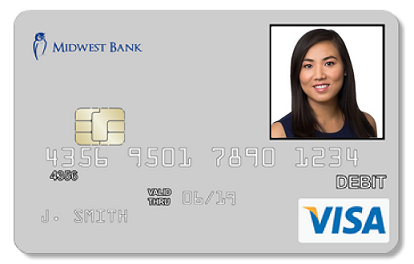 Is there a cost for a MyPIC debit card? How does my uploaded photo get approved? Every image that is submitted is reviewed for compliance with the Image Guidelines. We will notify you by email if there is a problem with your image and you will have the opportunity to submit another photo if you choose. Make sure that you refer to the Image Guidelines to ensure that your photo isn’t trademarked or under copyright. What size does my digital photo need to be and in what format? Please use any image that is at least 840 x 840 pixels, and no larger than 10 MBs in size. The image must be in either .jpeg or .bmp formats.